Airplanes are booked solid and everyone takes as much cabin size luggage as possible. It often occurs that there isn’t enough space in the overhead bin, and you have to pay extra for your regular cabin size trolley. 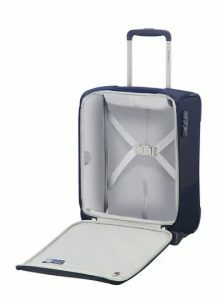 The Samsonite Underseater offers the best solution for this problem. This special trolley fits underneath your airplane seat. It will always be allowed to be taken on board. With the underseater you do not have to stand up and bother other passengers if you want something out of your bag during the flight. Simply bow over, and have access to all your most important belongings. No risk of hurting others with baggage that may fall out of the overhead bin when you try to get something out of your bag. Another advantage: leaving the plane in style. You don’t have to bungle anymore getting your baggage out of the overhead bin. But the most important advantage of the underseater may be safety. We all know that horrible insecure feeling when another passenger stands up, opens the overhead bin and picks something out. You don’t know if that person picks something out of his or her own bag or out of your bag. With the underseater this uncertainty is history. You can protect your own bag at any time during the flight. Where to buy this perfect solution? We advice you to put your hand luggage in a plastic bag. 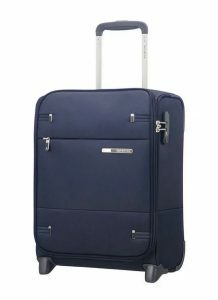 Visit Schiphol Plaza before you check in and buy the Samsonite Underseater at Leather & Travelgoods by Paolo Salotto for only 99 euro. The Paolo Salotto staff will help you smartly pack your hand luggage.